If you live in the US, there’s a good chance you’ve been affected by this week’s heatwave. If you haven’t yet made homemade lemonade to cool off, well, what are you waiting for?! 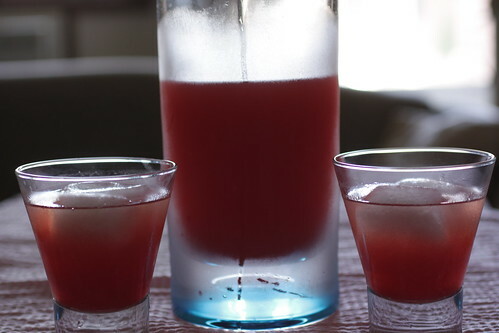 Earlier in the week, when I saw that Michelle made Deb‘s Watermelon Lemonade, I immediately decided to emulate her. Watermelon was the first entry on my grocery list. I added a couple of lemons for good measure, not sure if those that had been hanging out in my fridge for awhile would yield that much juice anymore. They did, but it wouldn’t have been enough. Always best to play it safe. When it comes to summer refreshment, nothing beats freshly squeezed lemonade; playing around with fruit combinations only makes a classic better. First, make the simple syrup. Heat 1 cup cold water with 1 cup sugar in a small saucepan over medium-high heat, stirring until sugar is completely dissolved. Remove from heat to cool. Next, make the puree. Place large chunks of watermelon in food processor (blender would work too) and pulse until liquidy. Strain through fine sieve into medium-large bowl to remove seeds. Juice lemons and measure out 1 cup. Pour through sieve to remove seeds. 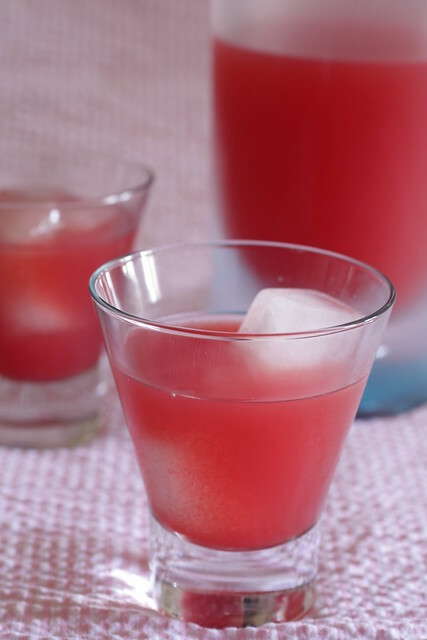 In large pitcher, combine lemon juice, watermelon puree, 3/4 cup simple syrup (or more or less to suit your taste), and cold water; stir to combine. Serve in glasses filled with ice. Chill remaining lemonade, stirring before serving (puree will separate out). *The heavier the lemon, the more juice it contains. Always try to juice room temperature lemons, they’ll give up more juice. I love this flavor combination. Perfect for these days, when in Miami it feels like 1000 F. Your drink would be ideal. Glad to have found your blog. Look forward to following your kitchen adventures here. 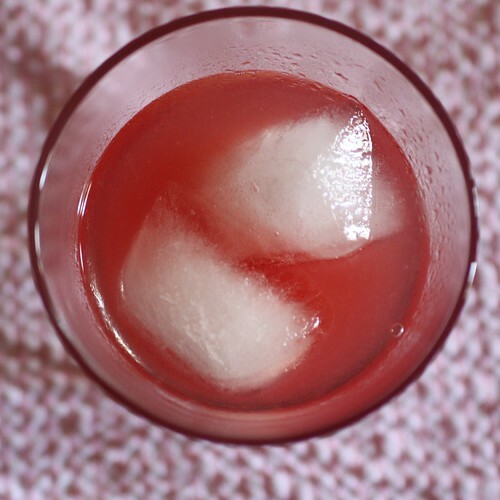 I am learning to keep some simple syrup on hand for great recipes like this one. Great flavors, refreshing and healthy – what could be better this summer? Highly recommended. You can kick it up with the addition of a splash of lemoncello, lemon vodka – even a coconut liqueur. Summer evening get together anyone? Michelle, thanks again for reminding me of this recipe – it was so fun, not to mention pretty.